AutoCAD is arguably the most powerful and feature-loaded 3D tool used by architects, engineers, designers and many other professionals whose work is closely related to 3D and 2D modeling. The results of their work may be crucial for the success of joint efforts of many other people involved in a project, hence the importance of data stored in AutoCAD DWG files. Just as any other files, these files can be damaged in various data corruption incidents and their creators may face the problem of a corrupted DWG file that AutoCAD refuses to open. DWG Viewer Tool is a specialized application that enables users to view the contents of damaged DWG files, analyze their structure and efficiently recover drawings stored in them. The software is based a fast and efficient file analysis and recovery engine that opens even severely damaged files and makes DWG recovery a matter of minutes. 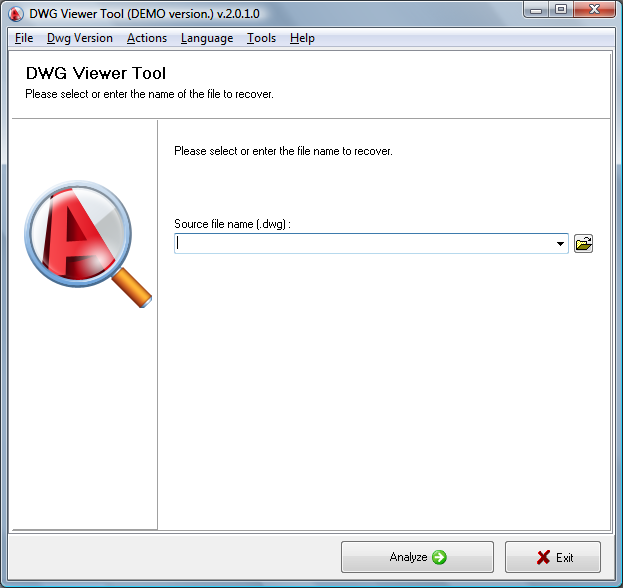 DWG Viewer Tool can also be used for viewing DWG files and selecting the necessary ones in situations when AutoCAD is not installed on the user's computer. The built-in viewer supports zooming and easy navigation across DWG drawings. The file recovery process is extremely simple and can be completed by users with zero experience in the area of data recovery. First, the user must select the damaged file and wait until the program has finished the analysis. Next, the user can preview the recoverable contents of the file or proceed to file recovery. On the final step of the process, DWG Viewer Tool extracts recoverable data and passes them to AutoCAD for further editing and saving. The only prerequisite for successful data recovery is the presence of a copy of AutoCAD on the user's computer. The viewing functionality of the program can be used without AutoCAD installed. DWG Viewer Tool is a fast DWG viewer and a reliable DWG file recovery solution that will be appreciated by all active AutoCAD users who want to be well-prepared for any data corruption problems.